These days is all the rage to announce Presidential Exploratory Committees to serve as bait for late night comedians, last Friday I had the idea to create a Presidential Brevet Exploratory Committee that would, as per its definition, be short lived. However it would have real exploration as its main purpose, not to mention an excuse to get ridding companions for a longish route, a century from San Francisco to the Point Reyes Lighthouse or to Marshall. 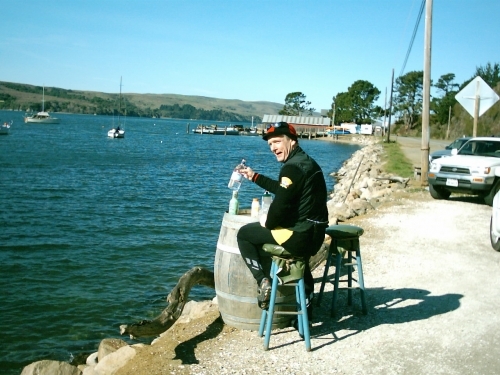 The 2007 San Francisco Randonneurs 200k is a week away and as I checked the weather forecast for the weekend, climate was supposed to be nice and sunny so a pre-ride ride was in order. I know, I know, I am familiar with the route, it is the same as last year's and the year before and... but it is an Exploratory Committee nevertheless. Sent the electronic communication to the usual suspects JimG and Jim E (Cyclofiend) and waited to hear responses. JimG could not ride on Saturday and on Sunday he was booked in the late afternoon for another more important engagement, something silly like the b-day of his wife :) I unplugged myself from the computer around 9 pm. After I woke up went to check the internets to see if Cyclofiend had answered and sure enough his message was waiting there. He could not ride Saturday but was open for Sunday. I decided to wait one more day and go with him and possibly JimG rather than by myself. On Sunday Jim (Cyclofiend) and I arrived at 9am and at the same time to our usual meeting place , somewhere in the Mill Valley bike path and soon after started climbing Camino Alto. Don't let his fixed gear bike fool you, he is fast on that QuickBeam thing. As usual the urban miles went fast. On the other side of White Hill we decided we would go to Marshall rather than going to the Point Reyes Lighthouse. The weather was nice but we had a headwind, not to strong but enough to make us work harder than usual. By the time we got to the north entrance of the Marin Bike Trail my computer read 25.3 miles from the Golden Gate (bridge). This is a very nice path that I've known since my Seattle-to-San Francisco tour some years ago but Jim (Cyclofiend) showed me the gravel segment last year, now I take it every time I head on that direction. The condition of the trail was perfect, recent rains and dry days have packed the gravel nicely. Olema came and went then Point Reyes Station and finally Marshall. We purchased some liquids and went out to have lunch, I noticed next to the store and on a perfect sunny spot there was an old wine barrel with two stools next to it, Instant lunch table. Lunch time went fast and before I knew it had been about 45 minutes, that is a long lunch break. We rode back the same way we came but now we had a nice tailwind. At the Intersection of Hwy1 and Point Reyes Petaluma Rd. Jim and I parted ways, he was gonna ride home via Nicassio > Lucas Valley I would ride home via Olema > Fairfax. I stopped at the Java Hut in Fairfax for a quick espresso an a quicker call home to let the wife know I was about ~1:30 hrs from home, no love pie misunderstanding this time. 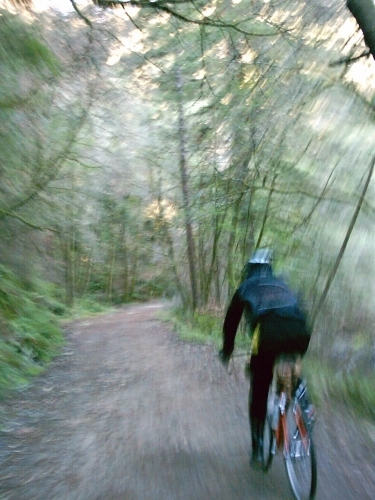 The Camino Alto hill hurt a little but it was the Mill Valley bike path that was really hard for me. Eventually all bad things go away and this time as soon as I got to the Sausalito waterfront I felt fine again, tired but fine. Made it home a little before 3:30. Another great century ride and a fine day on the bike. I must've been right behind you...I made it home just before 3:30 as well.